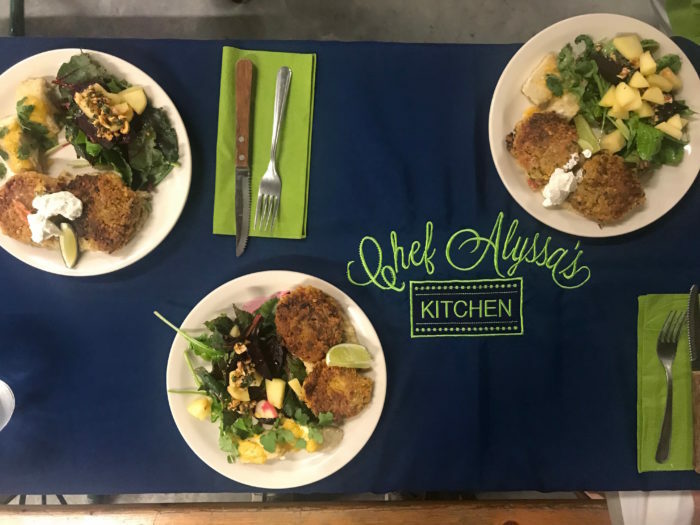 Husband and wife team Alyssa and Andrew Wilen merged their cooking and marketing skills to launch Chef Alyssa’s Kitchen in 2012. Alyssa is the chef and Andrew the marketing pro. At the time, they were just dating. 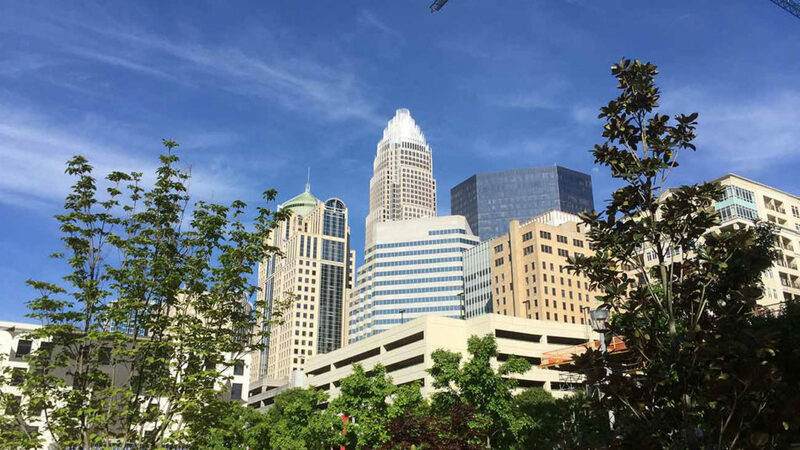 The bold move to launch a business together paid off in more ways than one — they got married in 2016 and Chef Alyssa’s Kitchen has become a household name in the Charlotte food scene. 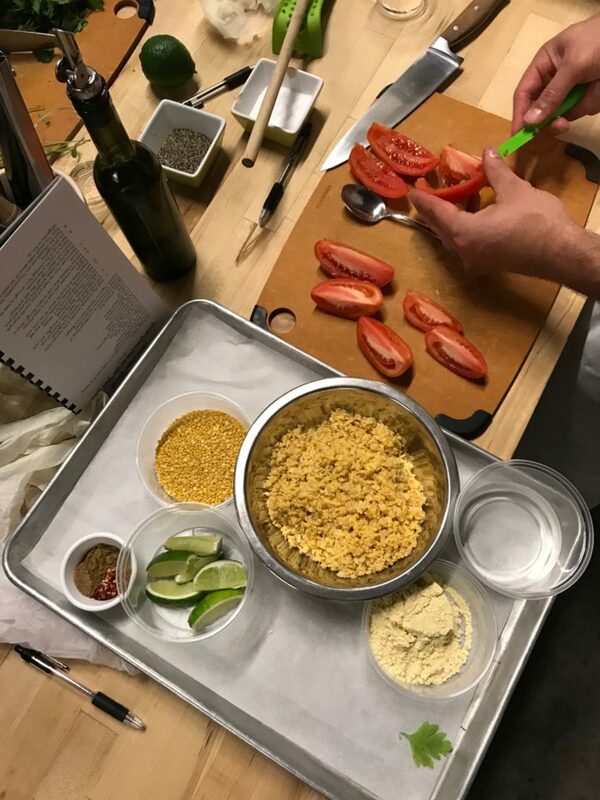 Cooking classes at Chef Alyssa’s Kitchen are hands on and interactive, covering topics from basic knife skills to vegetarian, paleo and French cooking. 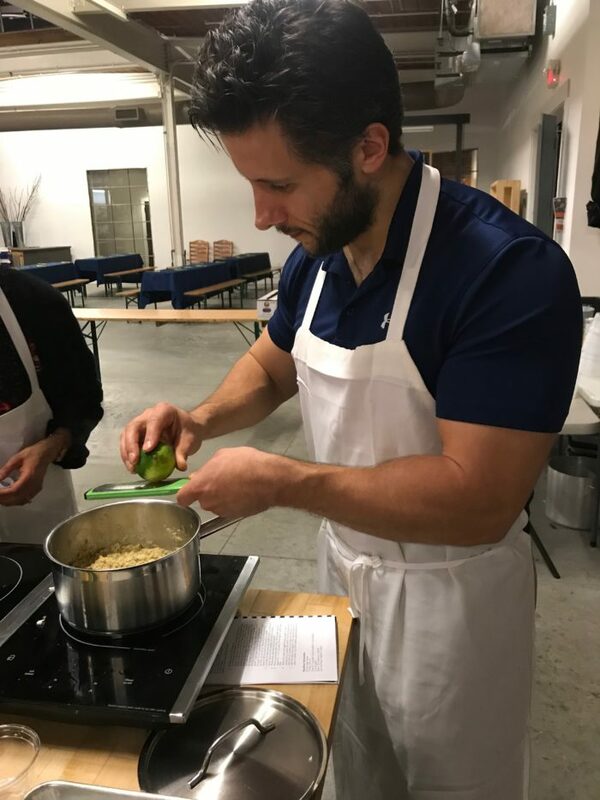 My husband and I took the winter vegan class in February. Here’s what to expect. Cooking classes are available in five levels from beginner to advanced. And you should really get honest with yourself about where your skills land on the spectrum before you book. 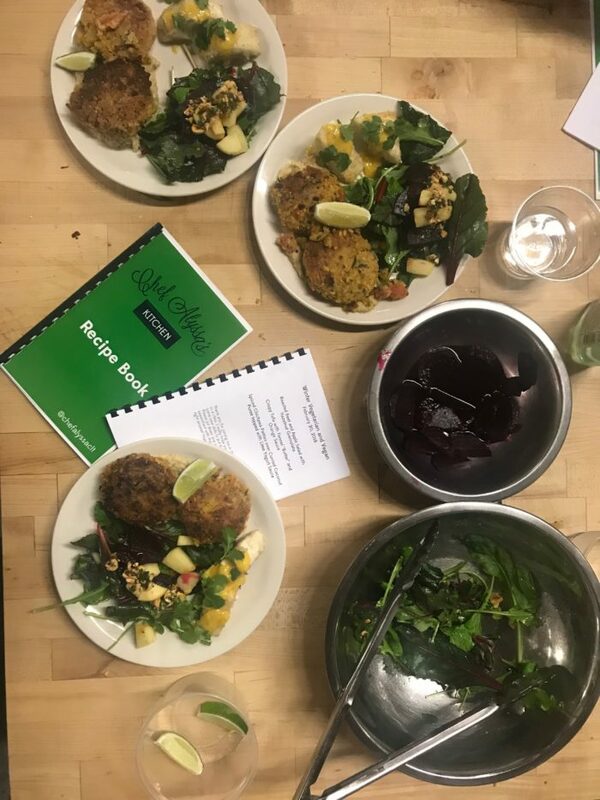 Classes are hands on, fast paced and you and your tablemates will be eating the food you prepare so let’s not ruin everyone’s dinner with our egos. You can BYO beer and wine so plan ahead. They’ll provide water but if you want anything else to drink (throughout the class and with dinner), plan to bring your own. Our tablemates had a bottle of wine and I left ours on the counter at home so I was pretty jealous. Eat a snack before you head to class. You’ll be standing at your cook station for a solid 2-3 hours and won’t sit down to eat until 8:30 p.m. or later. This is nothing compared to the physical toll a 12-hour shift takes on real kitchen pros. But I’m not a real kitchen pro. I’m soft and I need snacks. Ward of cranky hunger by eating something light in advance. The kitchen is located at Atherton Mill in South End. You’ll map to 2104 South Boulevard and head inside to the interior shops. 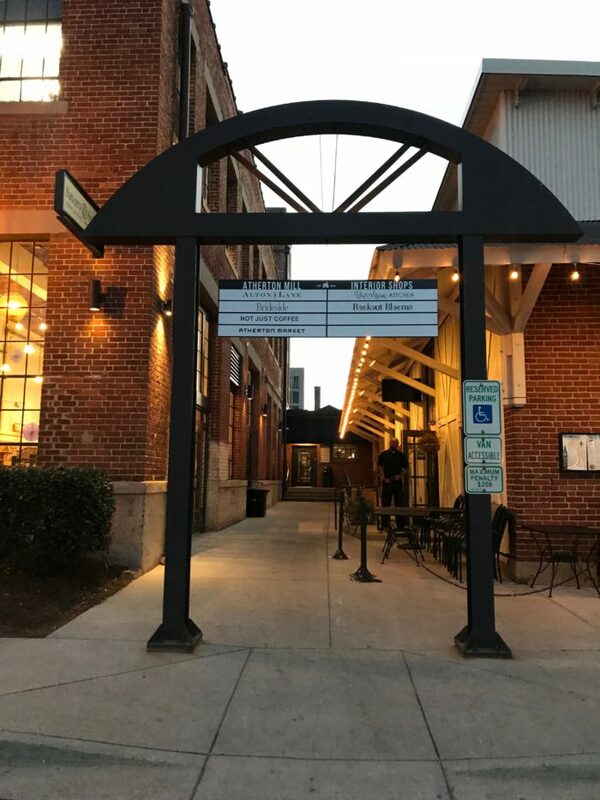 Note that due to ongoing construction at this development, Chef Alyssa’s kitchen along with the farmers market and Not Just Coffee have all moved from their original location in the carriage house to a temporary set up in the brick mill building. It’s the building that houses street-front businesses like Living Kitchen, Anthropologie, Warby Parker and Free People. Enter through any of the exterior doors and follow the hall towards a central atrium area where you’ll find Chef Alyssa’s kitchen. Tables aren’t assigned in advance and accommodate up to four people. You’ll work together as a team of four to prep the meal. It’s a really fun way to get to know someone new. 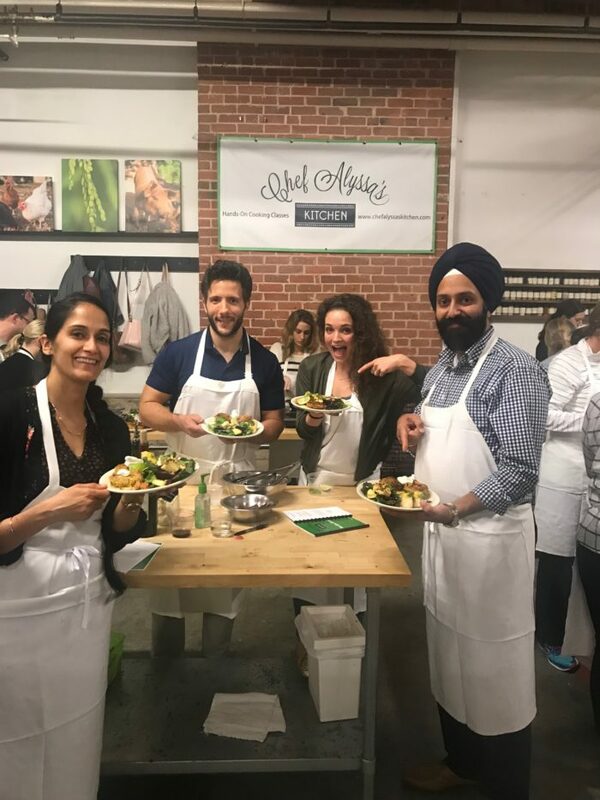 We’re biased and think we picked the best table but Chef Alyssa told me the table groups always end up vibing and having a good time together. We still think we picked the best table. If you’re anti-social (me) or aiming for a more secluded romantic date, there is one table for two people but it goes fast so book in advance. Your station is equipped with all the tools you need and pre-portioned ingredients will be delivered when it’s time to use them. 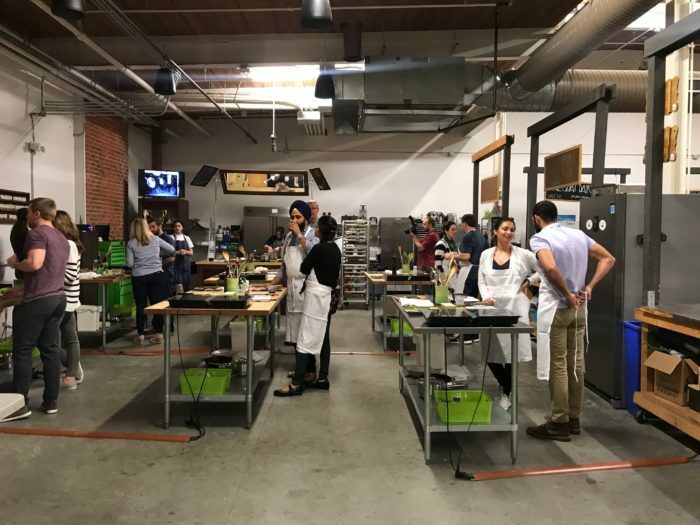 Several pro kitchen assistants keep each table on track by delivering your ingredients, cleaning up used dishes and moving prepped items to the oven. I wish they’d follow me around my own kitchen. By the end, you should have a complete meal and the whole class will sit down together to eat. To-go containers are available for your leftovers and everyone gets a recipe book so you can recreate the meal at home. 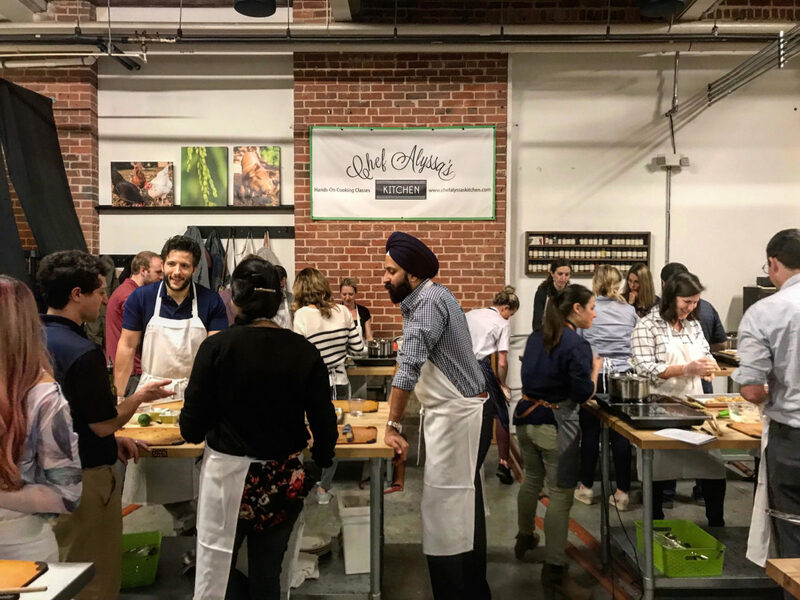 Chef Alyssa’s Kitchen hosts two to three classes a week — priced at $60 – $75. See the full schedule here and connect with Chef Alyssa on Facebook, Instagram and Twitter.